I come from modest means—soup beans and cornbread crumbled into fresh buttermilk. My two surviving McCoy uncles, now in their eighties, still tell stories about frugal times and my Grandpa Floyd. He left for Glory before I was born, so I grew up hearing how clean and fast Grandpa hoed the cornfield with the help of his leg braces. Thus, Grandpa is as real to me as if I had held his hand. No matter where I stand, there’s Grandpa in my mind, on the hill across the creek from the McCoy Bottom, walking in his braces, his hoe a crutch. 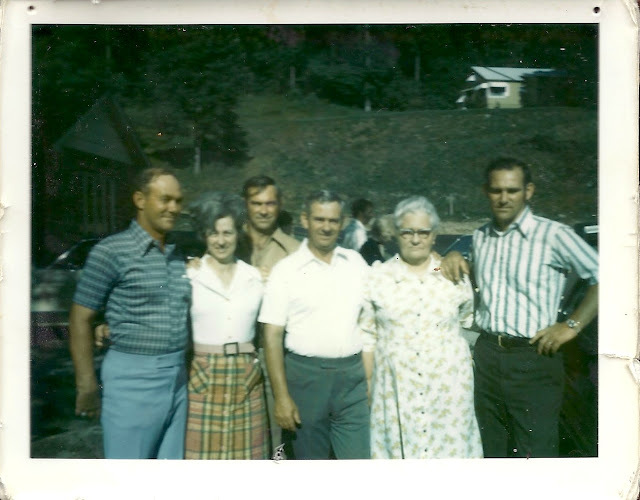 When Mom and Uncle Jim, the two eldest siblings, were called out of high school to Akron, Ohio, to assemble airplanes, Uncle Mix took Uncle Jim’s place behind the plow. He was thirteen. Whenever family gathered during our summer vacations, Uncle Mix, Herm, and Tab would talk for hours about plowing and sowing seed with Grandpa. I was too busy running the Bottom with my cousins to sit and listen. A lifetime later, I understand why my mother looked upon Grandpa’s hillside with longing, young trees growing where the corn once did. Each summer the new timber grew taller until they were no longer distinct from the surrounding forest. Every summer when I return to the McCoy Bottom to visit Uncle Herm and his gardens, I look upon Grandpa’s hill and praise God for memory and family. Grandpa Floyd’s mining accident is a central story in our family history. Each telling adds another brushstroke of shadow and light to the disaster and recovery that shaped my mother and uncles into the strong trees they became. I ate up Uncle Herm’s words like greasy beans, hoping nothing would interrupt the blessed feast he offered. The triumph and love in Uncle Herm’s voice settles deep into my soul. In my weakness, I draw strength from his everlasting bond with his father, my grandfather. Dear Reader, I come from modest men. On this cold, cloudy January day, I hunger for their homegrown roastin’ ears dripping with butter. Reckon I'll fry some hoecakes for dinner.